After a visit to Burgundy, Colin started by leasing a small quarter hectare patch of rocky clay soil in the Adelaide Hills where he planted clones of Pinot Noir and Chardonnay; a hobby block that for several years taught the trials and pitfalls of mildew, weeds and winemaking techniques. The French had close planted for a reason, based on 200 years experience. The resulting wines immediately started to show promise and before long, Colin Best was planning his retirement from engineering to devote his life to viticulture. Colin approached winemakers already established in the relatively young Adelaide Hills wine region and was overwhelmed with their generosity and assistance. The attitude and friendliness of the Adelaide Hills vignerons contrasted so greatly with the elements of the contract engineering scene, that Colin became a full time vigneron. A historic former woollen mill in Lobethal was ideally suited for winemaking, with thick walls and connections to effluent disposal and within a kilometre of my vineyard and this became Leabrook Estate Winery. 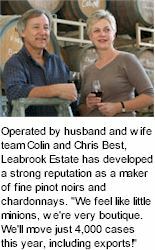 The Leabrook Estate vineyard lies in the Onkaparinga Valley in the Eastern area of the Adelaide Hills. The climate is well suited to most cool climate varieties and ripening is usually reliable, provided the fruit is exposed to light and there is no over cropping. 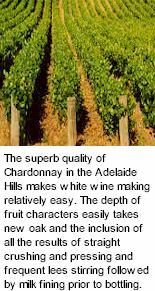 The vineyard lies on a gentle slope with relatively shallow soils. The soil profile consists of clays over dolomite and is reasonably well drained. The vineyard is protected from the prevailing winds causing good fruit set from flowering. Hedge pruning exposes the fruit to light, necessary to achieve grapes of the highest quality. If the season has been too favourable for the vine, and foliage is excessive, workers are dispatched to the vineyard prior to harvest, plucking leaves from around the bunches to expose the fruit, and cutting away excessive growth. Fruit quality can also be affected by other factors. All Leabrook Estate vineyards are netted to minimise bird damage. A large fan has been installed in the lower lying frost prone area of the vineyard to circulate air on frosty mornings and protect the young growing shoots. Leabrook Estate's policy is to achieve the best possible quality fruit. Vines are stressed with water levels kept to the minimum, while still providing healthy leaves to aid ripening. Spraying for mildew are kept to the very minimum; pesticide sprays are non existent, relying on natural predators to control pests. Picking time is a very complex affair. Up to 30 small batches of grapes are sampled and tested for taste and physical characteristics from the 2 hectare vineyard, and a picking strategy is developed over several weeks to provide the particular flavour profile designed for Leabrook Estate Wines. All fruit is hand picked with any damaged or unripe fruit discarded in the vineyard and during a final sorting during the crushing process at the winery. Great care is taken during picking and transportation such that the fruit arrives at the winery in exactly the same condition as existed on the vine. A small group of pickers are employed to ensure a constant flow of fruit from the vineyard to the winery for immediate processing. The same care extends through the winemaking process, when only gentle crushing is performed and there is no rough pumping of must, relying only on gravity to take the grapes into their fermentation stage. Boutique winemaking has a number of inherent advantages, mainly to do with quality control associated with small quantities. Every barrel can be hand nurtured during the year and crafted into a style based on the same fruit source each year. Techniques can be fine tuned, both in winemaking and possibly more importantly in the vineyard, where the vine's balance can be determined to give the best quality fruit for the particular site.